Last couple of trips we've caught several cobia. 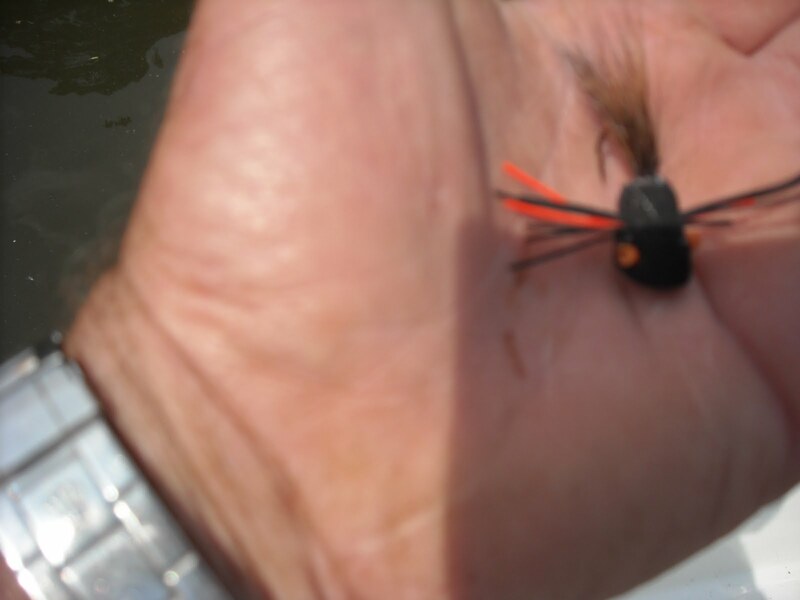 A lot of the ones that we're seeing are smaller, but we're still daily landing fish in excess of 50 pounds. The sea bass are going to have a bad day when the season opens on June 1, good sign of groupers on the nearshore wrecks and reefs....and......drum roll please.........ALL THE AMBERJACKS YOU COULD EVER WANT!! They're really cool on poppers. Every 13 years there is a cicada hatch, maybe you've heard them, especially if you live in Piedmont North Carolina. The last time this happened, we were fishing the Roanoke, helping Joe Albae film a show for Carolina Outdoor Journal and the noise was so loud, they couldn't film. After living for 13 years as grubs in the ground, the cicadas emerge from the soil, hatch from their shells, dry much as a butterfly does, then fly to the canopy where they breed. At the base of trees, their "husks" can be several inches thick. Two cicada hatches ago, I never knew how good I had it. Wet feet and dirty hands. I was a teenager, fishing on the Cowpasture River in Virginia. The topwater fishing that summer was incredible. As the cicadas fell from trees, they are quickly devoured by fish of all sorts, taking advantage from this mana from heaven. These pics were passed along to me by Joe Josie. 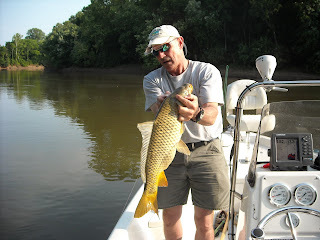 He and his father (87) have been taking advantage of the 13 year cicada hatch on the Roanoke River all of their lives. For his father, that would be only 5 or 6 times. They are sight casting to large carp cruising the surface and munching on cicadas with popping bugs and fly rods. "they saw alot but Danny was trying to get Dad close enough to make a cast. At 87 Dad has a bit of trouble making long casts to spooky fish. More later in the week"
Thanks for passing this along Joe. I hope that I get a chance to experience it this year and that I'm paddling you around in 13 years. 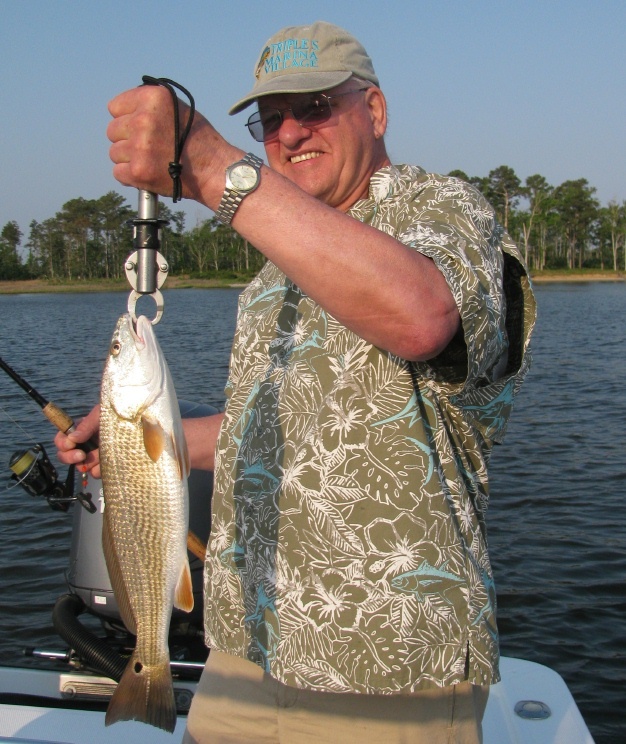 From Glenn Hudson regarding an upcoming article in the North Carolina Sportsman regarding using freshwater lures for saltwater fish. 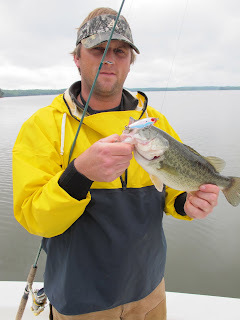 Looks like it goes both ways with this largemouth on a MR 17. I was able to return the favor. Charles Brown got the call today. 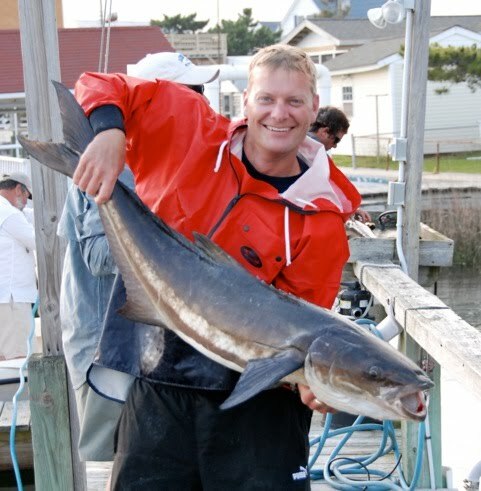 I found the big drum, with some cobia mixed in and called Charles before we made the first cast. When two tower boats get together, it draws a crowd and it didn't take long for things to fall apart, but we did beat down a handful of red ones and through the day a handful of the brown ones, including a 50 pounder. 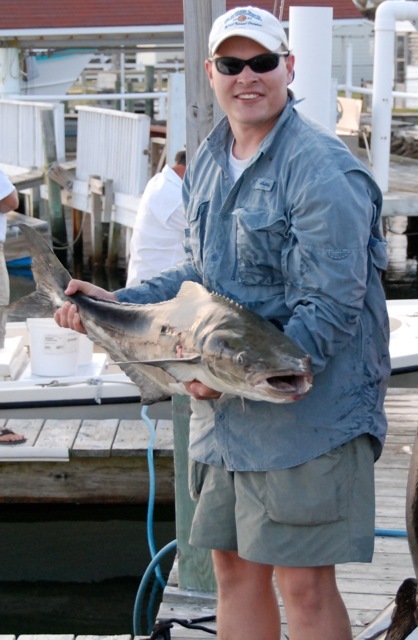 We got lucky and found a few cobia this morning, including a 60 pounder, then we got "the call". Fortunately, I was only about 5 miles away and made the run. Epic sight casting giant red drum for about 2 hours. Capt. Greg arrived on the scene and between the 3 of us, we landed over 60 big drum. Here are some pics and some others from this past week. Getting just enough to make it happen. Few aj's and a few cobia. Did catch a cobia on the fly yesterday and a nice cobia saved the day today after a couple of aj's and lots of looking for cobia. Got some serious fishermen the next few days that are into maximul pulledge. Gonna make it happen. Seems like much of our bait got sucked into the sounds......after a little recon, it looks like we may have another wave coming, hopefully a few cobia will be with it. We were strikeless yesterday and today, although the wind blew us off of the water a little early. Maybe all this wind is what we need to shake things up. It doesn't take much to turn things around. after icing a 83 pounder today. Yes, we are having a memorial service for the streak that died today. Had to bring part of my crowd in by noon, just as the fish started showing. Instead of going back to the meat, I headed off "in search of" and it didn't work out. Won't make that mistake tomorrow. Sounds like everyone that I left behind did real good. Thusfar I've cobia fished 15 days (the last 14 in a row), caught fish every day BUT today and landed 51 out of the 150 that I've seen. After over 100 miles of looking, we found little more than this moa moa or ocean sunfish. Capt. Charles Brown finally got us going in the right direction. We beat down a 62 pounder and this 75 pounder......and a few of their friends. 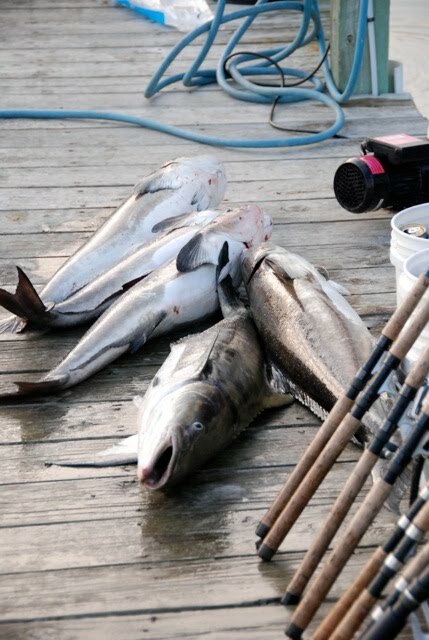 Thanks for another great Cobia Trip. Better than last year and also David’s first ever Cobia. mahi, 2 kings, 56 blackfin tuna and a white marlin yesterday." A 63 pounder will not be continuing her northerly migration....nor will several of her friends. Also caught a 4 1/2 pound flounder today. Capt. Greg didn't do as well with the cobes, but found the big red drum and got an early start with them. Offshore fishing is good with Capt. Brian on the Run Off and our other offshore boat friends. Capt. 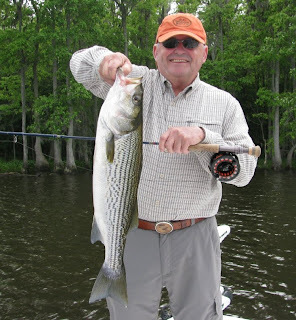 Gary is still getting the stripers up at New Bern, caught 4 of these on the fly yesterday. but we got 'em good, about like yesterday. A bit windy and things started slow, but they cranked up this afternoon. Never give up. Kind of like drum fishing, don't want to start setting the bar too high by posting a bunch of numbers, but Greg had a double digit day on the cobes. Capt. Ray and I were close. Capt. Ray's guy even caught one on the fly. Capt. Lee had over 100 stripers on the fly today on the Roanoke and Capt. Gary had 25+ on topwater on the Neuse. Looks like Capt. Ray's Louisianna trip is coming together this year, June 8-11, 48 hour bottom fihsing trip. 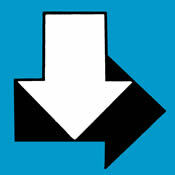 Drop us a line if you have an interst in that and we'll make it happen. .....and caught 3 cobia. Anna and a Culley and I slipped out of the office at 4 pm, saw 20 and caught 3 in less than 2 hours. Things must be warming back up. Capt. Ray got his today also. 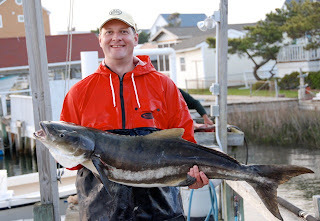 and so did the cobia fishing, but we are still seeing and catching a few fish. Yesterday was a mixed bag of spanish mackeral, bluefish, false albacore, a variety of sharks, amberjack, grouper and yes, we got our cobia. mahi, blackfins and 3-7 wahoo a day. Been a good strong mix of spring fishing. 49 mahi, 4 blackfins and 3 wahoo today." 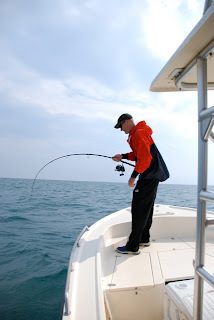 After a 80 fish morning, I'm heading back to the coast for some cobia action. Reports are that this cold front has cooled things down a bit, I'll find out tomorrow. Action on the Roanoke remains good, with the best of it early in the morning and late in the afternoon. Fly rods rule with great top water action. 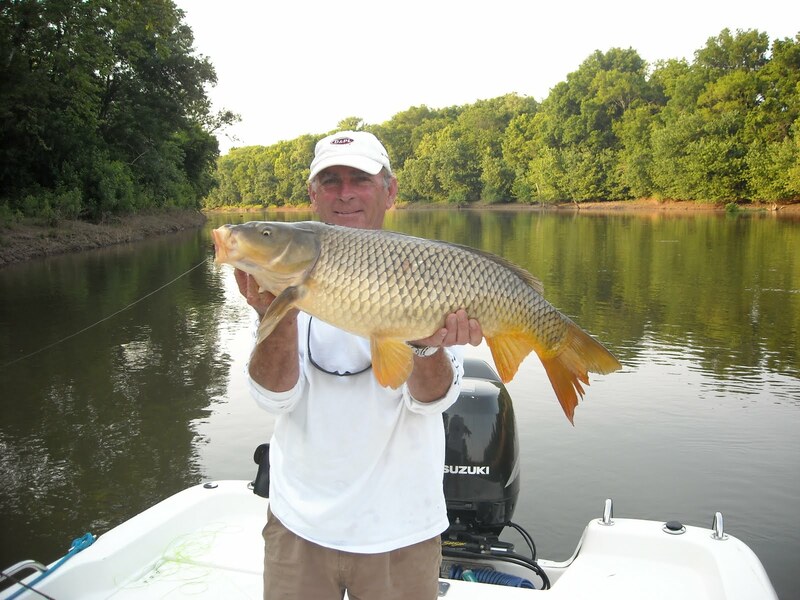 As long as water levels remain stable, this good fishing will continue well into May. Some of the Down East Guides are still making trips up to the river and have openings in case you want to get into the action. ........that the albacore were thick yesterday. I didn't bring any "little" rods or fly rods and we were regretting it. Albies had the bait balls pushed up and the sharks and cobia were crashing through the middle of them. We had problems pulling baits away from the sharks in order to tease and cast at the cobia. I also saw a tarpon on the shoals. Do Not Cast at the Whale! This young humpback appeared out of nowhere as we were fishing a bait ball. When we first saw him/her it was drifting with the boat about 10 feet below the surface, just watching us. It came up, took a breath and looked us eye to eye. We backed away and it ate the bait ball. .....heading back to the Roanoke for the afternoon bite. 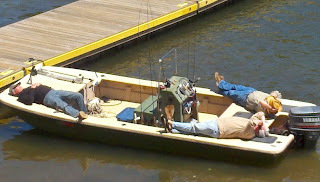 Definitly stripers today, 2 anglers with 100+ fish each on the fly by 11 am this morning. Today was the first day of the big spawn………and they’re catching cobia at the coast. I’m torn between the two and making two round trips to MHC to get the best of both of them…….not sure if I’m coming or going, but we’re catching fish. On the coast, Patrick and Rick Caton caught at least 8 cobia, Rick and Scott Austin even got into the big drum and another buddy caught black drum up to 70 pounds, plus the cobia. All site casting. It's killing me, but I can't complain about the day that we had on the Roanoke today. We hit triple digits on the fly AND on artificials and were half way there on topwater. Today was epic on artificials, the bait guys had trouble getting them. The fish wanted it moving. Fly rod was best. Topwater bite was nothing less than EPIC this afternoon, but not with the spawning fish, the ones that we were getting were bigger females that wanted to eat.